Anyone who grew up in the 1980’s has at some point consumed a cookie cake, am I right? They definitely weren’t the typical go-to for birthday cakes, so when they made an appearance, everyone was insanely excited. One of my aunts, in particular, had a definite thing for them, so anytime one of my cousins had a birthday, I knew we would be eating cookie cake. It’s amazing how one gigantic chocolate chip cookie can incite so much giddiness in a bunch of kids. I have a feeling it’s less about the cookie, and more about the notion of something different and out of the ordinary. That is the same reason I still love cookie cakes as an adult! I haven’t had one in years, but within a week’s time, I had a reader email me to ask if I had a recipe for one, and one of my best friends texted me to ask me the same question. It felt like the universe was trying to tell me that it would be a good time to make a chocolate chip cookie, so I obliged. I immediately thought of my favorite chocolate chip cookie that doesn’t require the dough to be refrigerated (thick and chewy chocolate chip cookies), but they tend to be a bit on the ooey and gooey side. While that’s absolutely perfect for cookies, it wouldn’t work as well for a “cake” that needs to be sliced and served. After slightly increasing the flour and adding playing around with baking powder and baking soda, I had a perfect combination of flavor and sturdiness. You could serve this plain, with ice cream, or decorate the top with some buttercream icing for a party. Or you could do what I did – keep slicing off a little sliver at a time until it’s ALL.GONE. When it comes to food, I’m definitely still a kid at heart. 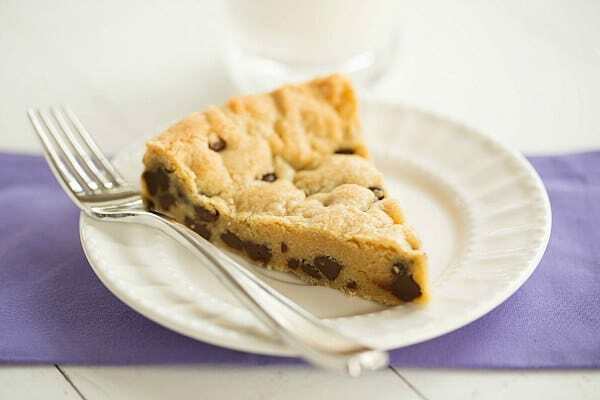 Who doesn't love a throwback chocolate chip cookie cake?! Preheat oven to 325 degrees. Grease a 9-inch round cake pan, then line the bottom with a round of parchment paper; set aside. Whisk the flour, baking powder, baking soda, and salt together in a medium bowl; set aside. Using an electric mixer on medium speed, beat the butter and sugars together until thoroughly blended. Beat in the egg, yolk, and vanilla until combined. Add the dry ingredients and beat at low speed just until combined. Using a rubber spatula, stir in the chocolate chips. Turn the dough out into the prepared cake pan and use your fingers to press into an even layer. Bake until the cookie cake is light golden brown and the outer edges have started to harden, 20 to 25 minutes. Remove from the oven and plan the pan on a wire rack to cool completely. 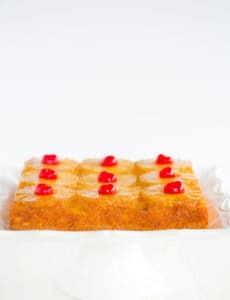 Use a metal spatula to loosen the sides of the cake from pan, then turn it out and place on a serving plate or platter. Serve or decorate as desired. Leftovers should be wrapped in plastic wrap and kept at room temperature for up to 5 days. I love this cookie cake! This is the only recipe I use! Ok so I usually do not review recipes but this time I felt I needed to. The main reason was the lack of reviews before I made it. This cookie cake was awesome! It reminded me of a cookie company cake. The texture was perfect. It was really moist. I did have to alter the recipe to make it gluten free. I used Pamela’s baking flour in place of the flour, salt and baking powder. Everything else I did according to the recipe and it was the best homemade cookie cake I have ever had. It was a hit at our party and no even knew it was gluten free. Hi Sam, I don’t think you could make these as cupcakes? Since it’s essentially a cookie? Unless you just pack the dough into the muffin tin and do it that way? I made this cake for the first time to take to a housewarming party. Cakes always make me nervous, since you can’t taste test it before you serve them. But because Brown Eyed Baker has never let me down when I follow her recipes exactly, I took a risk. Let’s just say it paid off! The cake was delicious and was a huge hit. Thank you, Michelle, for your tried and true recipes! Hi Marci, Thank you so much for stopping back to share your review; I’m so thrilled to hear that your family has been enjoying the cookie cake! 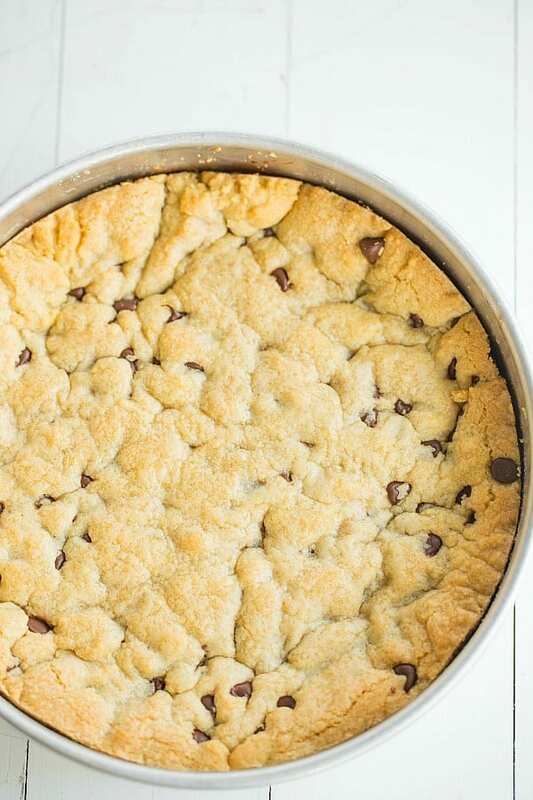 I can’t wait to make this I have been looking for a cookie cake recipe! very highly recommend, made in a standard springform pan. took on the longer side of cook time to be done. very good the next day too!! i decorated it with chocolate icing along the edge and sprinkles for a bday cake. was very popular. 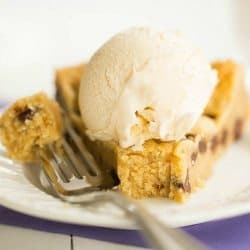 Can I leave the egg and make this cookie cake, or is there any substitute for the egg? I need an eggless version. Please help. You can’t just omit the egg, but I’ve never tried to use any type of substitute, so unfortunately I can’t say for sure what would be successful. I haven’t tried this recipe, but I saw it on another blog. Hi! My husband loves this cake but he loves peanut butter even more. 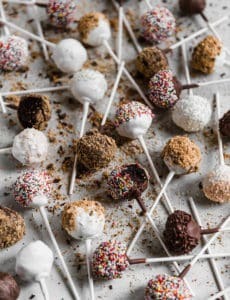 Is there any way to add it to this recipe? What would be the ratios? Thanks so much! I made this for my son’s birthday in a 9-inch cake pan as directed, but should have listened to my baker’s gut telling me this was waaaay too much dough for the size of the pan. Sure enough, it was doughy in the middle and literally fell apart in my hands when I turned it out. On the plus side, it was ridiculously yummy, and the little boys at the party all agreed that it was miles better than the cookie cake I bought to replace it. Will definitely make again in a larger pan. I have made this three times, but it never seems to cook completely. It’s delicious and we eat it anyways, but it’s not the way it’s supposed to be. I even increased the temp to 350 degrees and I cook it for 30 minutes. The inside is still gooey. Any suggestions? Thank you! Hi Lyn, I did cook mine at 325 and it came out as you can see above – not gooey. Some other folks have mentioned that they baked it at 375 – you can try that to see if it turns out better for you. 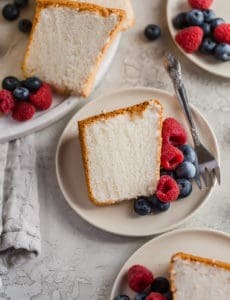 I’m looking for fun cake that I can put ice cream in the middle of and make a layer ‘ice cream cake’ any thoughts on if this would do well in a somewhat frozen state? Thinking covered in a chocolate ganache..
Hi Alicia, It will be pretty firm frozen, but if you let it sit at room temperature for 10 minutes or so before serving, I think it should work! Wow! I doubled the recipe and used 2 9-inch springform pans to make this cake. It was unbelievably good. I wasn’t expecting a cookie cake to be this exciting, but something about the thickness of the crust while still being gooey yet firm enough to hold its shape…perfect. 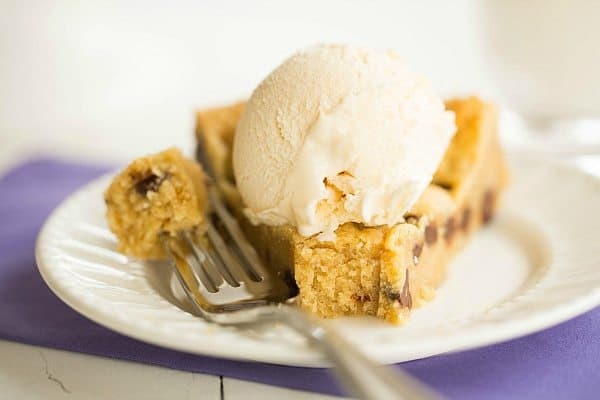 There can’t be a better recipe for cookie cake out there! I will say that I too had to bake a lot longer, probably 35 minutes. Thanks for this recipe! Is it best to bake the dough right away or can it be made ahead of time and refrigerated? If so, how long can it be stored before using? Thanks for sharing what sounds like a delicious recipe! Hi Kim, Yes, you can make this ahead of time and refrigerate it before baking. I would say up to 2 days in advance. Great!! That will save me a lot of time, as I can make it tonight & bake it with everything else I’ll be making on Saturday for my husband and his twin’s birthday :-) Thanks!! I agree with the others who say the cooking time is wrong—mine was still uncooked in the middle after 25 minutes. 20 minutes more in the oven and i think it’s done. the recipe is great but I think they meant to say to bake it at 375! Not 325….. do not bake it at 325 like we did! ha! way too gooey! I plan to make this and take it to visiting day at my children’s camp. What frosting would be best to use, considering it will be traveling with me for 24 hours before it is devoured on sight? Hi Tracy, Any type of traditional buttercream frosting should work! Just made a half batch of this and it was amazing. It was crisp and yet not completely baked through~ it probably needed more time in the oven to bake completely though but i like it this way. I am making this now. I’m using a 9 inch pan, and followed the directions exactly but it will not get done in the middle! When I stick a toothpick in the middle the center is still gooey. I know it’s not my oven, because I’ve never had this problem before and cook/bake regularly. I’ve had it in the oven for almost 40 mins. now.. Any suggestions?